Economic development statistics and the like. Could Spokane land Amazon’s second headquarters? Yesterday morning, Amazon announced that it would seek proposals from communities for a second headquarters, roughly equal in size to its South Lake Union campus, to be developed somewhere in North America. The e-commerce giant, which recently completed its purchase of natural grocer Whole Foods Market, intends to spend as much as $5 billion to develop a 50,000-employee campus outside of its Seattle base. In an unusual move, instead of searching privately for a suitable location, the company has opened a formal Request for Proposals from interested communities. Naturally, communities from Los Angeles to Baltimore have already started throwing their hats into the ring for the massive investment. As is typical, this got us thinking. Could Spokane launch a credible bid? First, let’s look at Amazon’s high-level requirements. The firm is looking for collaborative bids from metro areas, and has a preference for areas with more than one million people, a stable business environment, strong talent attraction, and big thinking. While Spokane does not meet the first criteria (the Spokane-Coeur d’Alene Combined Statistical Area has a population of about 700,000, and that stretches “metro area” to breaking point), arguments can be made that the other requirements can be met. The Spokane area certainly has a history of big thinking, having boldly pushed for and hosted a World’s Fair in 1974, against all odds. Its beautiful natural environment, strong quality of life and recreational opportunities, and low cost of living are certainly attractive assets. And observers say Spokane’s economy stays relatively stable even during recessions. Area leaders from Coeur d’Alene to Spokane cite business satisfaction as a major priority. Next, let’s dig deeper. Amazon cites a number of priorities and key decision drivers in selecting a site location. Site and Building Location. Amazon keeps it relatively vague, looking only for “the best buildings available”––whether redevelopment site, public-private partnership, or a greenfield area. In Spokane, while a decade ago Kendall Yards would have been a stellar choice, today we could focus on the South University District. With a new pedestrian bridge under construction, abundant vacant and redevelopable property, and a new Avista project in development, this area has the makings of a great urban neighborhood. If the property acquisition and consolidation can be properly managed, it has the potential and space––Amazon or not––to become our South Lake Union. Capital and Operating Costs. Spokane has a leg up on the larger communities: comparatively, it’s quite cheap. Our energy costs are below the national average, and building costs are low compared to coastal cities. Washington State is generally more expensive than other states, so any bid would require a state-level partnership. Incentives. Spokane has a basket of limited incentives it can offer, but localities are generally constrained in Washington State, and without a port district we have very few powerful options. Meanwhile, any successful bid would have to win out over incentive-rich states like Texas and Georgia. So for Spokane to have a competitive application, it would have to leverage state-level partnerships and potentially even legislative action. Labor Force. 50,000 employees is a lot––especially somewhere like Spokane. Is our labor force workable for a high-tech firm like Amazon? At present, probably not, although our education system has strong points between WSU, EWU, Whitworth, Gonzaga, and UI. To balance out this broadly negative point, combined with Spokane’s relatively small size, Spokane could latch onto a statewide proposal in cooperation with cities like Seattle, Bellevue, and Tacoma and instantly gain access to a wider talent pool which craves Spokane’s lower cost of living and strong quality of life. Logistics. Spokane has all the basics––easy access via I-90, a major rail hub, and abundant direct flights across the West Coast to Seattle, the Bay Area, and other locales. We’d lose points on lacking nonstop flights to the East Coast, including New York and Washington, D.C.
Time to Operations. Revamping the Avista Development proposal for the South Landing of the pedestrian bridge could be a way to expedite construction. Given that Amazon wants at least 500,000 square feet for Phase I, additional property would need to be assembled and entitled, which would take additional time. Community Cultural Fit. We’d gain points on our universities and commitment to education, as well as our history of big thinking. We’d lose points on workforce and cultural diversity, and we’d probably lose a few points on business climate among elected officials. While most would be nominally on-board, some fringe elements (see: Matt Shea, Spokane Valley City Council) could raise questions. Quality of Life. We’ve touched this already. It’s great! So would Spokane be able to put together a competitive proposal on its own, with cities like San Jose, Los Angeles, Chicago, and Baltimore in the running? Probably not. But a statewide proposal focused on expanding and retaining Amazon, potentially leveraging sites in Seattle, Bellevue, Tacoma, Vancouver (WA), and Spokane, could be difficult to beat. This would allow the Washington State government to assist in incentives and by utilizing tools not available to localities. It would also distribute the benefits of any such development across the state rather than concentrating them in already-prosperous areas, like Seattle. Anchored by strong transportation infrastructure, such as the expanded Seattle transit system, an expanded I-90, and potentially even statewide high speed rail, even residents outside of Amazon employees or Amazon-adjacent employees could see considerable benefits. In Spokane, this could mean a smaller campus of 10,000 – 25,000 people in the South University District, with the remaining employees split among localities across the state. Bellevue (which recently received a major Amazon expansion), Everett, Tacoma, Vancouver (WA), and Seattle are all credible choices. Is it bold? No doubt. It throws out the rules of the Amazon RFP process, creating a campus structure for Amazon more like a state university system (for example, WSU has locations in Pullman, Spokane, Everett, the Tri-Cities, and Vancouver) than a tech company. But it’s sufficiently creative and interesting that it wouldn’t be tossed out of hand. Is it unthinkable? No, it isn’t. If our area economic development officials are watching the hoopla over Amazon HQ #2 with envy, looking on as communities with more than a million people excitedly launch bids, they should hop on the phone with communities like Seattle, Bellevue, and Tacoma. They should call up the Washington Department of Commerce and our state legislators. Amazon is an important firm to our state, no matter how you feel about it, and the HQ #2 process puts all of that at risk. What better way to double down than to collaborate with communities across the state? SHARE YOUR THOUGHTS: What do you think? Should Spokane launch a bid for the new Amazon headquarters, either on its own or with partners from across the state? How important is Amazon to the statewide economy? Do you see it on the level of Boeing or Microsoft? In Spokane, where would you put a new Amazon campus? Share your thoughts on Facebook, on Twitter, in the comments below, or in person. We love to hear from you! In Silicon Valley, ten percent of startups hit it big. In Spokane, if we could hit half of that number, we would be doing quite well. Area startups have a good number of resources, with LaunchPad NW, McKinstry’s Spokane Innovation Center, and Startup Weekend Spokane, but still, we’re not exactly the hotbed for startups that we could be with additional capital and focus. A true startup fund, with a focus on mentorship, could be a real boon to our region’s innovation economy. Whether it’s a single angel investor or a group of local well-off citizens, we need some people to start venture funding startups. We need additional low-cost incubator space for startups to grow. We need the infrastructure to support the next generation of tech startups, from fiber-optic internet service to a late-night coffeeshop within walking distance. With a focused effort, Spokane could become a haven for startups. It just needs to coordinate disparate groups in different areas working around different goals. It needs to coalesce around a specific, clear, and certain plan aimed at growing innovation locally and globally. What do you think? Could startups be a path forward for Spokane? Would a startup fund, and greater capital for startups, as well as a focused effort to attract them, help to grow Spokane’s innovation economy? Shout out in the comments, on Facebook, or on Twitter. We love to hear from you. In 1980, the Spokane skyline welcomed its first newcomer in many, many years. The sleek, shiny Seafirst Financial Center was a modern new look for downtown, perhaps the most architecturally contemporary building currently in operation. But the building also represented something else entirely for Spokane: the strong ties that the city had built over many years with its western, metropolitan neighbor. 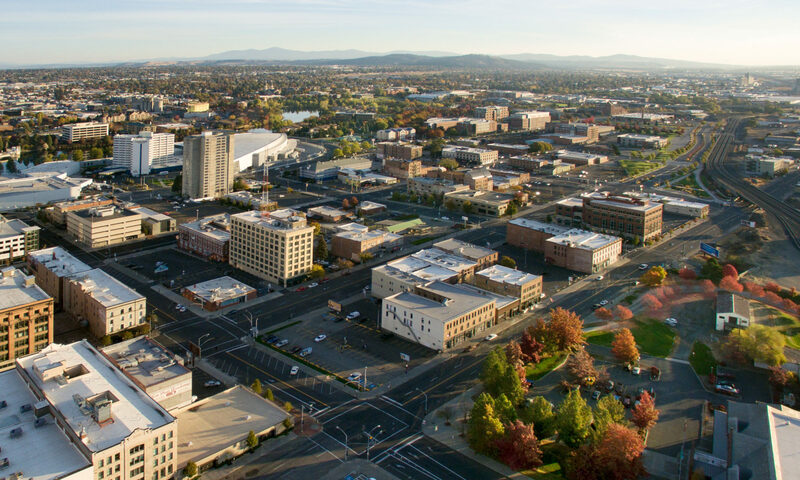 By recommitting to a major operation in Spokane, SeaFirst (which merged with Bank of America in 1998) showed a high level of confidence in the inland Northwest, even at a time when the area’s downtown was starting to show signs of weakness. Today, the Bank of America Financial Center, as it is now known, operates in relative obscurity, a simple Class A office building; nothing more, nothing less. But more broadly, Spokane’s ties to Seattle, which have always been significant, have been downplayed, downgraded, and similarly obscured. No longer does a major downtown building illuminate an obvious tie to our larger, older brother. No longer is Spokane’s economy so tied to Seattle’s. And believe it or not, I think that that’s a bad thing. Seattle could be an incredible marketing point for Spokane. We certainly have incredible access. Business travelers can choose between one of twenty daily flights on Alaska/Horizon or Delta, which offer best-in-class mileage programs, or a pretty simple four-hour drive. We offer a much lower cost of doing business, a lower cost of living, and an amazing quality of life, with easy access to outdoor recreation on local lakes, mountains, and trails. We have four universities, best-in-class medical facilities and doctors, and real resources and opportunities for expansion in the biomedical and technology industries. We could be an excellent complement to Seattle. We should be trying to attract Washington companies. We’ve already attracted McKinstry. Imagine Amazon or Microsoft opening a research and development facility here, away from the lights, distractions, and spotlight of metro Seattle. Imagine Stryker (medical devices) or Genzyme (rare disease therapies) opening engineering facilities, with the benefit of world-class doctors and hospitals right down the street. We should be using Seattle to our benefit. And yet, instead, Greater Spokane Incorporated markets the city to “stable” companies with “innovative” and “promising” long-term “growth potential.” Companies like Vivint. What do you think? Should Spokane adopt closer ties to Seattle? Would our economy be better off tied to a strong one like Seattle’s? Would there be a benefit in marketing the way our city complements Seattle? Share your thoughts in the comments, on Twitter, on Facebook, and in person. We love to hear from you. Why have I been absent? To put a long story short, I’ve been writing a lengthy paper on affordable housing and the implications of land use policy on its implementation. Take a look at the article on Scribd (or click after the break for a preview) for an interesting read. With Spokane’s visible homeless population, it’s clear that the current housing model in the area is not working. Perhaps some of our land use regulations and ordinances are to blame. From 2000-2006, the Spokane area was deep in a planning process for future light rail transit (LRT) in the South Valley corridor from downtown to Liberty Lake along Riverside and Sprague, with future extensions possible to Spokane International Airport and Coeur d’Alene. STA commissioned study after independent study, all indicating that at $17 million per mile–the projected cost of the developed project–light rail would more than pay for itself, generating billions in economic development. And significantly, because the cost of such a proposal is likely to skyrocket in coming years as the region grows, it was discovered that the annual operating cost of the light rail system would be less than the annual growth in construction costs, were the project to be built at some point in the future, instead of now. But then, in 2006, the project was ditched after a hastily-written advisory vote was placed on Spokane’s November ballot. Though the totals were close (52-48), STA and local leaders considered it a mandate against light rail. Now, light rail as a proposal is back from the grave. The Inland Empire Rail Transit Association, or InlandRail, has shown its first concrete signs of life since 2011. The organization recently engaged in a billboard campaign, and a recent Spokesman-Review article noted the possibilities that LRT presents. There’s a renewed sense that light rail could be one solution in an overall package of transportation projects designed to plan for future growth in the area. Even STA has suggested light rail for the South Valley corridor. It’s clear that a new sense of optimism has developed surrounding transit projects in the area. After the break, view more videos of the original light rail proposal. Look at all that space devoted to the temporary storage of vehicles. And that’s not even all of it! That’s just a small sampling of the surface parking lots located north of the railroad viaduct in downtown Spokane. I’m aware that I missed a few in West Downtown, but this paints a stark picture of an unfortunate reality. Surface parking diminishes urban vitality and wastes valuable space. Structured parking, while more expensive, is also more dense, and can allow for innovative first-floor retail and offices, or residences located above the parking. In Spokane, speculative buyers have snatched up surface parking lots on prime development sites, knowing that their value will only increase in coming years. But this creates a problem: lots aren’t sold because the owners want too much for them, and developers wouldn’t be able to turn a profit at higher land costs. As a result, we get gridlock. Perhaps the issue could be at least partially solved by creating a public development commission or other authority with the power to buy up underutilized properties and sell them directly to the developers with the strongest and most realistic proposals for the sites. Portland has had tremendous success with this model, revitalizing neighborhood urban districts and breathing fresh life into its downtown area. One site in particular that we’d like to see developed is the two-block surface parking lot centered at Spokane Falls Boulevard and Stevens (the lot between the Bennett Block and the Liberty Building). The Bennett Block is undergoing a major renovation, and the site seems prime for a residential mixed-use high-rise or two with abundant glass and perhaps One Lakeside-esque balconies. Who wants to make it happen? What do you think? Does Spokane have too much surface parking? Could our city be better served by building out our parking lots and better economizing space? What about the idea of a public development commission? Share your thoughts in the comments, on Twitter, Facebook, and in conversation. Washington State University’s Health Sciences Building in Spokane’s University District illustrates the possibilities presented by graduate education in the Spokane area. Clearly something still is lacking. Could it be time to relocate programs from WSU Pullman to WSU Spokane? Here’s a bold idea that might not attract too much popular support but should be considered as part of a broader package of ideas that would revitalize downtown Spokane and enhance educational opportunities and outcomes in our state. What if Washington State University moved a significant number of its graduate-level programs to its Spokane campus in the University District? This would be a bold move requiring a massive build-out on the Riverpoint campus, but it would also solve one of the bigger issues facing our city addressed in Idea #12; namely, a lack of quality graduate-level programs, especially in the sciences, engineering, and other STEM fields. This deficit of graduate education might be a result of having such a large research institution located “nearby,” but not actually within our city limits. Pullman is nearly 75 miles away, which results in challenges for both the institution and the city in educating and retaining young urban professionals in order to attract attention from large companies looking to relocate. Under this scenario, WSU Pullman would become primarily and undergradate-focused institution with some research being performed by professors and students of the remaining graduate programs, but also new and ground-breaking opportunities for undergraduate research in STEM fields. A focus on teaching would heighten the level of education offered by the institution and better educate undergraduates for a twenty-first century global economy. WSU Spokane, meanwhile, would expand into a full-service graduate student campus, meeting the needs of its students through high-quality labs and field work and a wealth of internship and externship opportunities in the local community. Perhaps a commuter rail service could connect the two campuses in order to drive synergies between the two offered products. Of course, I don’t expect WSU Pullman to go undergraduate-only anytime soon, and I don’t expect WSU to move all graduate programs to Spokane. But I do think it raises an interesting question. How can WSU Spokane better provide graduate education in STEM fields to the region? Is it time for major STEM programs like computer engineering to be relocated to the Spokane campus? How can our statewide higher education system meet the needs of a globalizing twenty-first century economy? These are questions the community needs to be asking as it develops a vision for the University District and for the city moving forward.